Golfers around the Queen City get edgy in October. Those last few days for good golf are about to give way to that oh-so-long winter interval. (At least we still have the Golf Channel.) There’s a great temptation to dust off Hilton Head and Myrtle Beach brochures from winter golf shows and ponder a long weekend in coastal Carolina. Problem is, how do you sell yet another golf trip this year to your better half? One solution: Make the drive to east-central Ohio and Longaberger country, where you can bring along family or friends (or both) to enjoy two of the state’s best golf courses, soak in the pristine setting of the Appalachian region in autumn, and see American craftsmanship at its best. 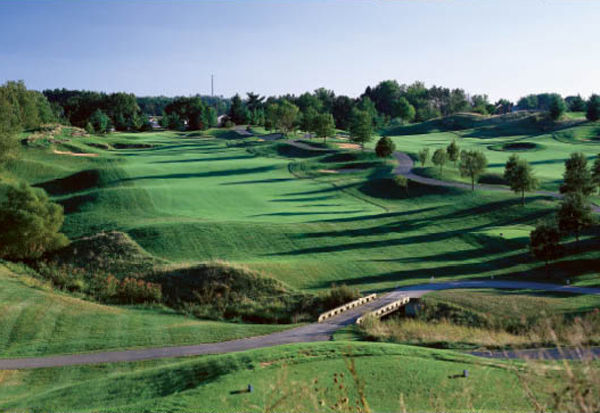 In the mid 1990s, Dave Longaberger, founder of the hand-crafted basket manufacturing company that bears his name, hired acclaimed Toledo-based golf architect Arthur Hills to design a memorable course on property Longaberger had purchased in Nashport. Those close to the energetic entrepreneur knew that this was another step he had taken to make the Newark and Dresden areas prime destinations for visitors from across the country. Gently carved from the foothills of the western reaches of Appalachia, Hills’s vision at Longaberger can be seen in the marriage of rolling fairways and elegant greens to the surrounding wooded landscape, where you likely will spot a red-tailed hawk gliding overhead or a family of deer tip-toeing through the forest on the edge of this parkland-style course. In 2001 it was designated a certified signature wildlife sanctuary by the Audubon International Signature Program. Appreciating Hills’s respect for nature is one of the great pleasures of the course, but the real fun is had out on the fairway. General Manager Danny Ackerman, who has been at Ohio’s No. 1-rated public course since it opened in 1999, notes that there is little room for error. Whether taking the ultimate challenge from the 7,243-yard back tees to the 4,985-yard forward box, ball placement is at a premium, demanding pinpoint accuracy on every hole. It’s especially critical on the No. 18 green, where the ball will roll unless you plant it perfectly above the pin. To top off your experience, sample some of chef Jeremy Brun’s original recipes in the clubhouse. Longaberger makes for a memorable finish to your Ohio golfing season. Dana Fry and Dr. Michael Hurdzan are responsible for the transformation of this former 150-acre farmstead near Zanesville into a challenging course, rated 4 ½ stars by Golf Digest. Stretching 6,508 yards from the back tees, Eagle Sticks provides the avid golfer with spectacular views of the undulating hills and tree-lined valleys from tee boxes that have been placed on the high ground surrounding the parkland setting. The course made Golf Digest’s list of “America’s 100 Greatest Public Courses” in no small part thanks to the rolling landscape, elevation changes, variety of vegetation in the course, as well as the 90 or so sand bunkers that make attacking the greens a hefty challenge throughout the course. General Manager Kevin Knapp adds that the “Nine Stars of Golf Package,” a special deal that includes play at the Longaberger Golf Course, provides the Ohio golfer with a clear alternative to a more expensive sojourn to the Carolinas, Florida, or other “fly and play” destinations. Standard lodging is available at local hotels, but you could go off-package and upgrade to the Cherry Valley Lodge, a cozy resort located in Newark that provides a central gathering point for friends or family during your weekend. No matter where golfers stay, Knapp says, the autumn ambience in Central Ohio is always an above par experience. Let’s say you did not bring your significant other. Even so, there are a couple things that have to be on your (ahem) basket-list before you depart the region. First is seeing the seven-story Longaberger Company headquarters building in Newark. Its exterior is an oversize model of the company’s best-selling market basket. Dave Longaberger baffled his advisors and others when he demanded that the construction include latticework and handles to resemble his company’s trademark product, but the $2 million price tag in 1990s dollars, paid off handsomely in all the publicity the company gained from its landmark edifice. You can see the headquarters/basket for miles around, announcing that you have indeed arrived in Longaberger country. The second recommended stop is the Longaberger Homestead, located near Newark in Frazeysburg. As the name implies, the Homestead is a community created by Longaberger to allow guests from across the globe to visit the unique craft manufacturing company and buy hand-made American products. The Homestead features the Crawford Barn, where guests can make their own baskets with the help of a crafts expert; the factory store; a welcome center; and a host of other stops located in a artisan’s village updated for the 21st century. And here’s a hint from Longaberger CEO Tami Longaberger: If you did not bring your better half along on your golfing getaway, consider the hand-crafted baskets and other seasonal creations at the Homestead as diplomatic thank-you gifts. Originally published in the October 2011 issue.